Harry Howell didn't mind the Seals' uniforms, but the skates were a different story. There is a new look in the NHL this season with each of the 30 teams sporting new uniforms. But though there have been numerous looks in the NHL over the decades -- from classics like Chicago’s uniforms to third jerseys that have made some fans cringe -- one thing has always remained the same: Hockey skates are black. Back in 1970-71, Charles O. Finley was the new owner of the newly renamed California Golden Seals. Finley also owned baseball’s Oakland Athletics, an emerging powerhouse, and decided that his new hockey team should wear Kelly green, polar bear white and gold, the colors the A's sported. Actually, the A's uniforms were Kelly green, wedding gown white and gold -- and white baseball spikes. Finley's "rebranding" of the Seals was the franchise’s third name change in just three years. The franchise started out as the California Seals in 1967, but by December of that year had been renamed the Oakland Seals, a name that lasted only a couple years until Finley took over. 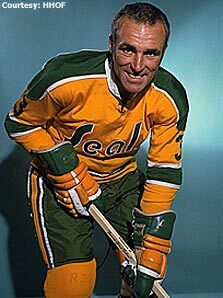 So, if there were ever a franchise that would toy with a hockey tradition like wearing black skates, the California-Oakland-California Golden Seals would be that franchise. The brand-new California Golden Seals started the 1970-71 season on Oct. 10 at the Olympia in Detroit with new uniforms and Kelly green and gold skates. Wearing those new skates in an Original Six barn was an interesting mixture according to Harry Howell, who was 37-years-old at the time and in his 19th NHL season. Howell was in the final years of a Hall of Fame career, and here he was in Detroit in a redesigned uniform and garish skates. The uniform didn't bother Howell or his teammates. The skates, however, were a different story. “When I was in Oakland, no one knew we were going to be wearing these skates, so opening night, we open up Detroit’s season,” Howell said. “So you go in and they turn off all the lights and they start to introduce players, but they put the spotlight on you. Guess who is the first guy out because I’m the oldest guy on Oakland? What made it worse for Howell and the Seals was the opposition. Gordie Howe, Alex Delvecchio, Gary Bergman, Frank Mahovlich, Billy Dea, all grizzled NHL veterans who had played against Howe for years, were laughing as they watched the introductions. Howell missed Finley’s next change. Finley decided to put white skates on his players in time for the 1971-72 season. Howell had been sold to the Los Angeles Kings in February 1971 – going to a team that had all-gold home uniforms and all-purple road uniforms. The Kings’ uniforms were never well received, but at least the team did wear the traditional black skates. But Howell couldn’t totally escape white skates, After a bit more than two years in Los Angeles, Howell went back to New York and signed with the New York Golden Blades of the World Hockey Association. The Golden Blades, like the Golden Seals, were a failed hockey club that was rebranded. The New York Raiders had money problems, like the Seals, and had problems selling tickets, like the Seals. There were two differences: The Raiders played at Madison Square Garden and paid a very high rent, and they were the third team in town behind the Rangers and the expansion Islanders. Seals hockey was the only game in town in the Bay Area. The Raiders owners, Neil Shayne, Richard Wood and Sy Siegel, could not survive averaging less than 6,000 paying customers per game; they sold the franchise to Ralf Brent, who renamed the team the Golden Blades and ordered the white hockey skates with golden blades. Assistant Captain Harry Howell of the New York Golden Blades wore this skate featuring a gold plated blade during the 1973-74 WHA season. The Blades' players would transfer mid-season to become the New Jersey Knights. 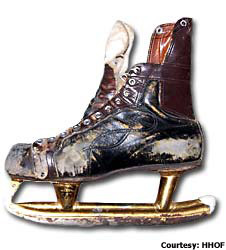 The Golden Blades relocated to Cherry Hill, N.J., and played – in black skates – as the Jersey Knights in a rink that was slightly tilted, with one end of the ice higher than the other. Visiting teams dressed games at a local hotel instead of the Cherry Hill Arena because there was only one dressing room. Howell played out the season in Cherry Hill and went to San Diego the next season after California businessman Joseph Schwartz bought the team. Howell finished his career with the WHA’s Calgary Cowboys in 1975-76, then returned to the NHL the next year as the Cleveland Barons’ assistant general manager. The Barons were the relocated Seals; the franchise had fled the Bay Area for Richfield, Ohio, in 1976. Though the Barons wore traditional hockey skates, the move from the West Coast hadn’t solved the franchise’s problems. “The two years there were chaotic. It wasn’t good,” he said. “Cleveland was not a National League town; it was an American League town. Everybody said; ‘Well, they fill up the arena downtown. The arena downtown held 8,000 people. But when you have a 16,000-seat arena and you have an ordinary team, not a great team, it is hard to put people in the seats. “We went there and finally we merged with Minnesota. Both teams had been out of the playoffs, and by 1981 we were in the Finals,” where they lost to the Islanders. By the late 1980s, Barons-turned-North Stars owner George Gund was looking to move the franchise to San Jose. Instead, by 1991 Gund was operating an expansion team in the Bay Area and as part of the deal, he took some of his North Stars players. The circle was complete; remnants of the Seals franchise was back in the Bay Area. Unfortunately for Howell, he doesn’t have any of those white skates – which now are highly sought-after collectables.